Looking for a little more action on your Costa Rica vacation? Swing through the trees like one of the local Titi Monkeys on one of our Canopy, Canyoning & Rappel tours departing Dominical & Uvita. The lush rainforest of the South Pacific coast is home to not just the Congo and Capuchin monkeys that inhabit much of Costa Rica, but the incredibly adorable Titi monkeys, otherwise known as Central American squirrel monkeys. In fact this is one of the ONLY places in Costa Rica you will find the Titi monkeys as their main home base is Columbia and Bolivia. 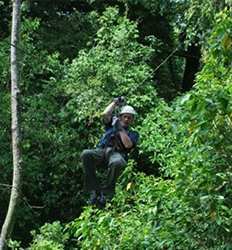 We invite you to come and enjoy our sensational canopy tour in Manuel Antonio and swing with the monkeys in the treetops!! Domincal is known for its surf while Uvita is known as a launch pad for all tours involving whale watching, dolphins and snorkeling, but if you are looking for a bit of an adrenaline rush and the quintessential Costa Rica tour, look no further. If you are staying in one of the Costa Ballena destinations of Domincal or Uvita, let us pick you up and take you on the Monkey Canopy Eco Tour in Manuel Antonio. We guarantee you will have the adventure of a lifetime in Costa Rica. Did you ever dream of swinging through the trees with the monkeys? This awesome canopy tour in Manuel Antonio will bring you as close as you can get! Join the Titi Monkeys as you swing through the treetops in the Costa Rica primary jungle on this heart-pumping zip line tour.